If you’ve read our blog on Glen Coe (here), you’ll know how highly we rate this as an area to visit in Scotland. As it is such a popular area for outdoor-lovers and full of so many cracking walks, we decided to list our favourites below. We’ve included the links to the Walk Highlands website which has detailed route descriptions, starting points, public transport information and GPS/GPX coordinates. As with any walking, it’s always useful to go prepared for every eventuality and we’ve often been caught out on the hills when the weather has turned. Sturdy footwear is essential for almost all of these walks. After acquiring the Glen Coe estate, Donald Alexander Smith and his wife, moved from Canada to Scotland. As his wife became increasingly homesick, Smith created this lochan and had the surrounding forestry planted to aide her. There is a full-sized carpark here. Allow a couple of hours to wander around the trails (there are three in total, all marked the full way). Most of the walking is on flat, well paved tracks, however there is one steep section (nicknamed ‘Heart-Attack Hill’ by one of our family members) and a forested section where the path gets slightly muddy. The views of the lochan and the surrounding mountains (including the Pap of Glencoe) are stunning and make the short trip worthwhile. This takes the title of being my favourite ever hillwalk. A self-confessed Munro-bagger, I’ve climbed a few of the surrounding hills but this walk in particular was a stand out. There is a car park at the side of the A82 although this can get slightly busy as the day goes on (particularly if the weather is good). This walk consists of two munro-peaks and after leaving the carpark and climbing up to the ridge, you have the choice to head right or left in whichever order you like in order to reach the top of both. Depsite being two Munros, the going here is particular straightforward and makes for a pleasant day out on the hills. Although this walk can be done in 4-5 hours, it’s a good idea to pack lunch and make a full day of it. The views, especially on a blue-sky, sunny day are absolutely stunning and include many of the Glen’s surrounding mountains. The pyramidal shape of Stob Dearg (the peak at the front of this pair) is one of the most iconic viewpoints in Scotland a must for all hillwalkers. Although situated beside the previous walk (Buachaille Etive Beag), Etive Mòr is considerably more difficult. On a wet day some of the going underfoot will be particularly slippy, and in winter there is a high avalanche risk. There have been many fatalities on this mountain so it should not be underestimated. Park at a layby on the side of the A82 at Altnafeidh and head up to the first ridge. You will reach Stob Dearg first, before an undulating ridge towards Stob Na Broige. Stob Dearg being the main peak as seen from below offers incredible viewpoints across Rannoch Moor and a feeling of “was I really up there?” when back at the car. After reaching the two peaks and descending to ground level, there is a walk of around a kilometre back to the original car park. If climbing up the hills isn’t your idea of a good time but you would still enjoy a walk, it is possible to go around the hills previously mentioned. The two passes is a 9-mile circular route that heads directly between Buachaille Etive Beag and Buachaille Etive Mòr before looping round the far side of Etive Beag. The walk has an obvious path most of the way, crossing a burn a couple of times, however can be muddy in wet weather, and tricky to navigate in wintry weather. My main thoughts on this route were how long it felt to complete, despite the majority of the walk being on the flat. It does however give stunning views down Glen Etive which make the long walk worthwhile. 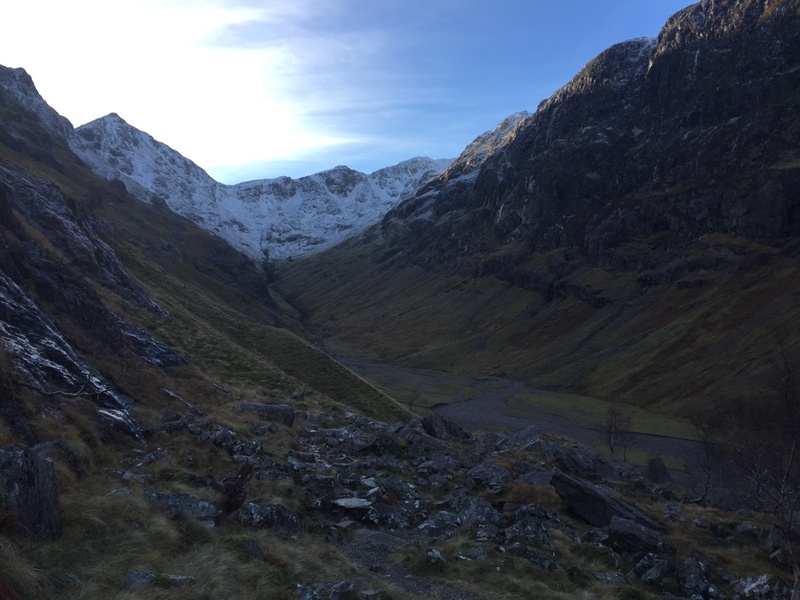 One of Glen Coe’s secrets, start by parking at the viewpoint in front of the famous ‘Three Sisters’ and take the path down behind it towards the river. After descending a new metal staircase (this used to be an old wooden staircase, but it has been greatly improved), cross a wooden bridge across the river Coe. After the bridge, there is a climb up some rocks, greatly improved by the addition of a metal handrail, but which would still be difficult in wet conditions. There have been fatalities in this gorge in the past, so care is needed. The route soon climbs a well-maintained path (there is only one tricky section crossing a smooth rocked area, very slippy in the rain) and works its way up to the valley, passing through a deer fence. The huge expanse of the Lost Valley appears, cut off from down valley by rockfalls and is said to be the perfect place for people to have hidden stolen cattle. It is also an area fled to by the escaping MacDonalds during the Glencoe Massacre. The valley floor is a great place to sit and have lunch before ascending further into the mountains, or turning back towards the start. This is a short, pleasant walk and can be done in around 1-1.5 hours. There is a car park marked for Signal Rock along the A82, or alternatively this walk can be started from Clachaig Inn. Follow the well-marked path down to the River Coe, cross a wooden bridge and head up through the deer fence towards Signal Rock. The rock is said to be the place the Macdonald chief would address his clan, and is set to be where the signal was given to the Campbells to begin the Glencoe Massacre. Although a pleasant climb, the views at the top of the rock are limited due to the vast surrounding forestry. After descending Signal Rock and continuing to follow the marked path, you will soon reach another viewpoint, An Torr, before returning to the path back to the start of the walk. This walk can be started by parking in the same layby at Altnafeidh. 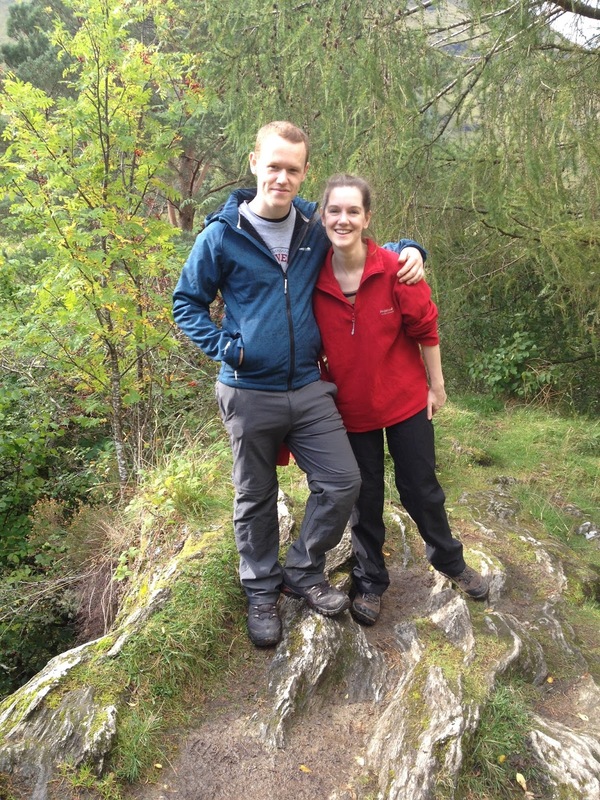 It is a section of the West Highland Way (a 151km walk from Glasgow to Fort William). Follow the path marked for the West Highland Way (look for the wooden markers with the thistle symbol) and this can be followed as far as Kinlochleven (taking around 3 hours), or a much shorter version to the viewpoint at Stob Mhic Mhartuin which gives cracking views before returning to the start. This summat is one of the iconic peaks in the area, seen clearly on the drive around Glencoe and Ballachulish. There is a small car-park along a forest track to start, or alternatively the walk can be extended by starting at the Clachaig Inn. The path, although initially obvious, becomes eroded during the climb and the final section is steep. Despite being much shorter and lower than some of the surrounding mountains, this is still a very strenuous walk and is best allowing a full day to complete. After a tough climb, there are stunning fews of Ballachulish, Glencoe and Loch Leven.